Dolly friends, I am so excited to share one of my latest re-roots with you! This is Samira. She was a 2014 Holiday Barbie, on clearance for just under twelve dollars. Even though I knew she would have a head full of glue, I just couldn't resist her at that price because she was so pretty. So I bought her, took her home, and immediately removed the hair and glue. Poor thing sat bald on a shelf for several weeks (or months?) while I finished up some other projects. At first I thought it was a shame to have to re-root her. 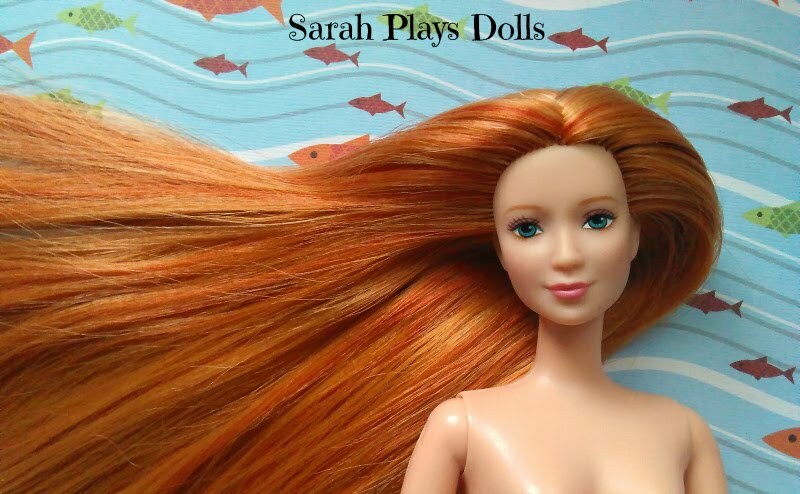 It's always sad to put new hair in a doll who would have perfectly good hair, were it not for the goop seeping out of her scalp. But when I finished her, I was happy I had. She was pretty before, but she's gorgeous now! The extra length and thickness really accentuate her beautiful face. And... then there's also the little surprise underneath. Here's a glimpse of it from the back. Yes, that's a little bit of red peeking out. You can see it better in the next photo, with her hair floofed out. Samira is living in the red and black room on my book shelf, with her friend Kyla. She is part of a support group, Glueheads Anonymous, formed by some of my other dolls, where they get together and celebrate being glue-free. They also console other glueheaded dolls who are waiting for their turn in the salon, and who are a bit nervous at the prospect of having their heads popped off and all their hair yanked out. In addition to having new hair, Samira got a new body. She's happy to be able to move her arms and to sit. She's wearing a new hair clip from Meijer (clearance sale last week... couldn't resist) and a necklace I made; I forget where I found the fine chain, but I love how proportionate it is. She's also wearing a black dress I made. I'm fairly proud of it, considering it's my first time putting darts in stretchy fabric. I hope to make many more and to become as comfortable with darts as I am with hair. Looking forward to sharing more re-roots! I just finished rooting a Glam Luxe Midge with long brown hair, and now that I know how to thatch a part, I did one for one of my earlier re-roots. The difference is amazing! I may have to show off my girls in groups of two or three, because I am an impatient creature. I just hope the girls understand. Thank you for checking out my work! I've made a lot of progress since my early, sometimes terrible re-roots in 2000, so I do enjoy showing off. 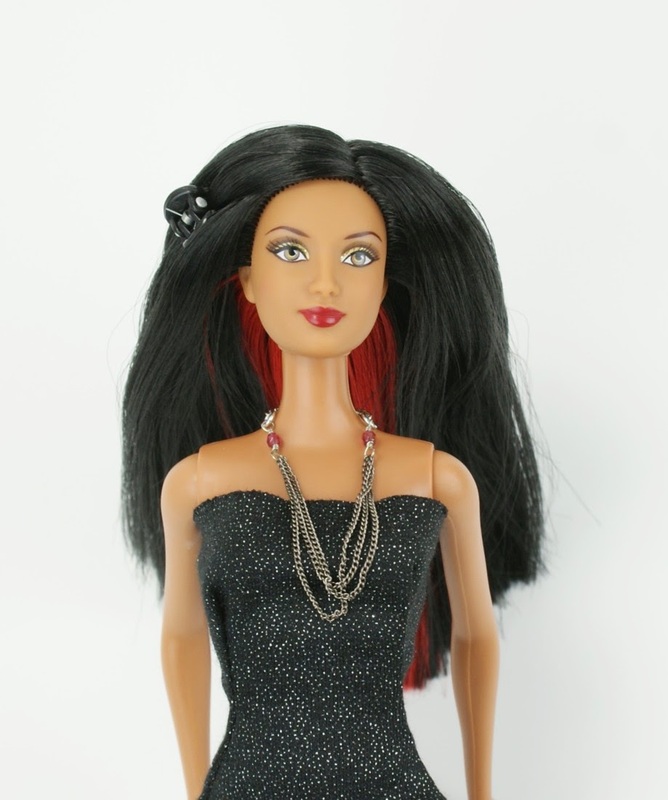 I have to say, though, that I owe a lot of the credit to better doll hair! Thanks, Restore Doll and Dolly Hair! And equal thanks to Dan Lee for his instructions on thatching a part -- they're the best I've found. Sarah, this is really impressive. She looks as though she came with that hairstyle. Bravo!!!! Nice work! It's always impressive to see what a difference new hair can make for a doll, but your choice of texture and colour here makes it even more so. You're so right about the difference new hair can make. I recently saw a photo of a re-rooted Barbie Basics doll with a Theresa face mold, and I was blown away by how pretty the doll looked. She was a knockout. I'm really glad I found a Theresa at the thrift store with a very botched hair cut, because I'm looking at the face mold in a whole new light. My first diorama... in a gallery? !